"Now with a name like the Devil's Armpit, you'd think it'd be a right jolly place. -We didn't sleep much at night." My first foray into the land of graphic novels was very entertaining. 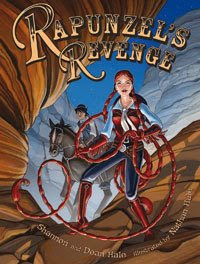 What's not to like about a red-headed chick with a scorpion tale hair braid and a stinging attitude to match it! Throw in a handsome, mysterious sidekick, an evil stepmother, plants and animals with serious growth issues, and you have a modernized version of the classic fairy tale. Without giving too much away, many questions I had as a child are answered here. Why was Rapunzel trapped in a tower? Why did her hair grow so freakishly long? Who is that boy that saves her? We all know how the original ended, but in this crisply combed-up version, the only one that does the saving is Rapunzel. I have yet to move into the world of graphic novels, though I'm thinking about reading Persepolis this year. This one looks fun. Maybe I'll try it, too. It is a fun book. I know nothing about graphic novels either, other than they are generally longer than comics? I read this one because I'm a fan of Shannon Hale and I thought my daughter would like it. ...or maybe the poor, misunderstood step-sisters getting even with "I got the looks so I got the prince" Cinderella. I love Shannon Hale. This is her first attempt at a graphic novel. I saw it at the library the other day and thought about reading it. I've never read a graphic novel, so I hesitated, but it sounds good, from your review, so I think I'll give it a try. Isn't "Watchmen" considered a graphic novel? My son gave me a copy for Christmas, and it's on my TBR list. I have no idea what your non-english says. I've decided to read 6 graphic novels this year. At least one of them will be by Alan Moore. One will be this one. I'm so glad you reviewed this Lula! Ooo, I'm learning another language on this blog. French? Nope, not French, or I could read it. Or at least I could read a couple words. I haven't read a graphic novel yet and this seems like it would be a fun start. I know my bro-in-law, Nathan, liked the "Watchmen" and he considered it a graphic novel when I talked with him about it. It sounded fascinating as well. I was at the bookstore on Sat. and I saw and Anime graphic novel - it looked liked you read it differently than a regular book - from back to front. Is that normal for all graphic novels or just for Anime? I'm curious. I couldn't look into it further at the bookstore because we were in a hurry so I thought I'd ask here. i'm surprised Byron hasn't read & reviewed Watchmen yet. according to my son (who touts this book highly), it won (kinda, sorta, but not quite) a Hugo Award around 1988 or so. IIRC, Byron was working his way backwards through the Hugo winners. maybe it's on his 2009 TBR list. BTW, the "Quis" phrase is Latin and is the closing line of Watchmen. it is also cited in Pratchett's The Color of Magic. eerie.